What an amazing learning experience the 2012-2013 school-year has been. Craving more responsibility, with increased time dedicated to student and faculty development, a growth mindset is a phrase I’ve become familiar with. Reflecting on the year, I understand why these words resonate with me….because it’s the ethos by which we as educators need to live by. 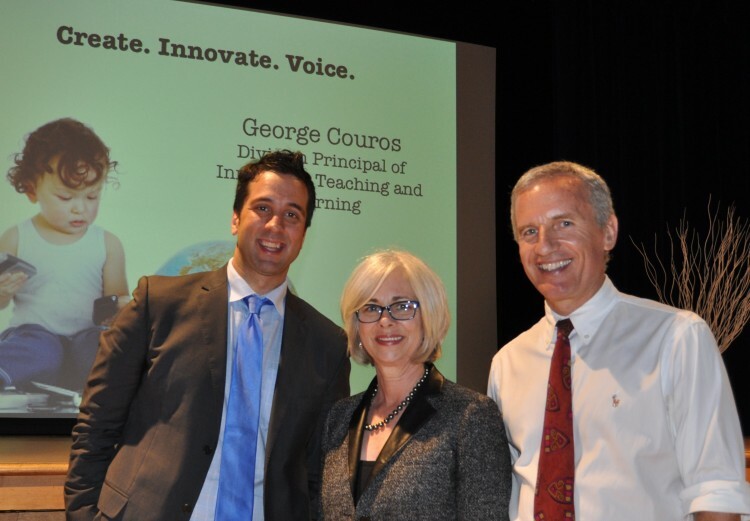 Once a teacher quits learning, he or she is done as an effective educator.” Words from George Couros, divisional Principal of Innovative Teaching and Learning for Parkland School Division. George spent the day at SCH Academy last week, moving from one workshop to the next, culminating in a convincing, thought provoking, and inspirational all school keyote – Create, Innovate, and Voice. The primary focus of the day was on students…how we as educators have to empower them in their learning, prepare them for the future, while providing them with every opportunity to succeed today and beyond. To improve the student learning experience, it’s our duty to continue to evolve and enhance our practice. The Connected Educator and Connected Leader workshops provided a clear guideline for how we can move beyond the four walls of SCH Academy to connect with educators across the globe, to share with and learn from. Meanwhile, continuing to build community amongst teachers dispersed between two campuses. George asked faculty if they would benefit from learning what their colleagues are doing in their classrooms…the answer was an overwhelming YES. Twitter and blogs are two easily accessible resources that will allow the 8th grade teacher on the Cherokee campus to learn what is happening in 11th grade history on the Willow Grove campus. Finally, the best part of the day for George and me was the hour he spent with fourth grade girls and fifth grade boys talking about digital leadership. I watched close to fifty young students immersed in a presentation based on being safe and responsible on the Internet….AWESOME. After spending the day with George, I became well aware of his intelligence and the power of his message. Yet I wasn’t fully prepared for the emotion he shared with our community during the all school keynote. Such presentations can be tricky…one person attempting to engage a large group of people with varying opinions and personalities. Nevertheless, he was able to make a personal connection with the entire audience…each individual focused throughout, even enjoying a few laughs. Personally, I was captured most because he felt welcomed enough to share stories about his personal life and family. Reflecting back on my goals for this year, some have been achieved and others are still a work in progress. Thanks to George, the growth mindset we aim to achieve amongst each and every individual in the SCH Academy community seems more attainable. A framework is in place, now we must keep at it. Check out George’s last blog post where he gives a shout out to the SCH Academy Center for Entrepreneurial Leadership – 3 Important Trends We Should Focus On in Schools. In true Daytime fashion I’ll end with a video…one George shared during his keynote that had the entire crowd in stitches Perhaps the most important self defense video on the intenet via Twenty Two Words. This was a really fun and engaging day for myself. I really appreciated connecting with you and others. Having the ability to laugh while you do your work is vital to success in my opinion. If you like the people you connect with, you are more likely to be successful. Keep up the great work! You and your faculty are on the cusp of something very special.